I was looking at this UPS label when I realized it contains some interesting architectural assumptions. It offers me a porch, a deck, a garage, a back door, a patio, etc., on which to collect my package. How does UPS account for other architectural styles? Oh – you tic Other! Now I get it. The international option. "Just leave it in the harem," I'll say. "Leave that one beneath the torii gate, sir." "Leave it in the Other." I'd be curious to see international versions of the tag. Perhaps the vernacular does change from locale to locale...? Are the tags universally written in English? Do tags in Japan and China use characters? What about apartment deliveries? And what if we stepped back in time and UPS existed when there were milk-chutes? Any readers have tags from around the world? Collecting and posting would be interesting. That's exactly what I was wondering: what does UPS do in a country where people don't have porches and decks - I mean, obviously their business isn't incapacitated by this architectural absence, but how do UPS tags elsewhere in the world describe and account for local architecture? 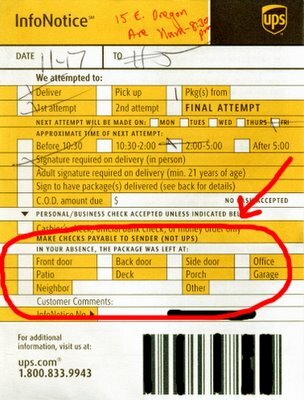 The UPS vernacular. I'm seeing some sort of graphic / database of vernacular feature cross referenced with UPS, FedEx, DHL, and the US Postal Service. It would be interesting to see where the language of architecture and the building of architecure overlap with overnight shipping companies and their ability to essentially flatten space / time. Personally at my home in Vermont I have had no luck with writing "Please place on back porch of small wooden farmhouse..." in the comments section of anyhting I've had sent to me. It always seems to end up at my neighbor's front door - of a large brick farmhouse. A bit off topic - but I've been contemplating NetFlix - imagining the intial marketing / sales pitch - "Yeah - with all this great cable / internet / on demand technology, we are proposing to MAIL our subscribers (essentially electronic) entertainment." We'll take the high tech - and mash it with the essentially old tech pony express and deliver a physical product with more ease and less cost than you may be able to download or order entertainment on demand. Loaded imagery of the family sitting around the old tube, with a movie delivered to their doorstep, stoop, mailbox... makes for a fine Norman Rockwell-esque painting of modern day simplicity. "Remember when the milkman brought fresh milk each day?" "Remember back when we had a fresh Action Thriller every other night..."
"Remember when you sat on the front porch waiting for the UPS man to arrive?" Space flattening. Milk-chutes, Mailboxes, In-Boxes, Homepages - funny how the real and the virtual overlap. We will be folding space before long.